It's almost like on demand coaching in a box! Paul Wade's Convict Conditioning Prison Pushup Series explodes out of the cellblock to teach you in absolute detail how to progress from the ease of a simple wall pushup—to the stunning "1-in-10,000" achievement of the prison-style one-arm pushup. Ten progressive steps guide you to pushup mastery. Do it—and become a Pushup God. 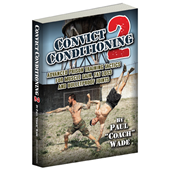 How sure are we that Convict Conditioning, Volume 1: The Prison Pushup Series (DVD) will work for you? Simply fill out the form below and put Convict Conditioning, Volume 1: The Prison Pushup Series (DVD) to work for you right now. Obviously, we would go out of business if Convict Conditioning, Volume 1: The Prison Pushup Series (DVD) didn't work, the way we said, right? With the promise of a full refund if you're unsatisfied, you have nothing to lose by trying Convict Conditioning, Volume 1: The Prison Pushup Series (DVD). Go ahead and try it today. Paul Wade adds a bonus Ten Commandments for Perfect Pushups—which is worth the price of admission alone. And there’s the additional bonus of 5 major Variant drills to add explosivity, fun and super-strength to your core practice. Whatever you are looking for from your pushups—be it supreme functional strength, monstrous muscle growth or explosive upper-body power—it’s yours for the progressive taking with Convict Conditioning, Volume 1: The Prison Pushup Series. In Paul Wade’s Convict Conditioning system, no matter what kind of movement you’re working on, you focus on a chain of ten progressive exercises. When you master one exercise, you move on to the next, and so on. Because the later exercises build on the earlier ones, they are sometimes called the "ten steps". When you reach the tenth exercise, you will be just about as strong as it’s possible for a human being to be in that movement. For this reason, the tenth exercise in any chain is called the "Master Step". How this all works will be crystal clear if you’ve picked up a copy of the Convict Conditioning bodyweight book. • The pushup is the best exercise there is for building strength and size in the pectorals—one of the real "workhorse" muscle groups of the torso. • The anterior deltoid, a major shoulder muscle, is connected to the pectoral and gets a hell of a workout from pushups as it transmits the force from the chest to the arms. • Pushups also build big, strong triceps along the back of the arms. If you want big arms, you need to work your triceps, because it’s the biggest muscle of the arm—at least a third bigger than the biceps. • Numerous other muscles have to work hard isometrically to lock you into position as you do your pushups. These muscles include the lats, the abs, the hips and the legs. • Pushups also build functional strength. The muscles you use for throwing, pushing, and striking are pretty much the exact same muscles you are building when you work hard on your pushups. Unless you have great pushing strength in the torso, shoulders, triceps and elbows, you can’t be considered "strong". Are you failing to become monstrously strong from pushups because of these mistakes? Most athletes fail to become monstrously strong at pushup movements, because they only know two or three types of pushup; maybe classic pushups, kneeling pushups, and pushups with the feet up on something. Just having three exercises in your toolbox isn’t enough to allow you to maximize your potential. Paul Wade shows you ten different types of pushup, all given in order of difficulty. In fact, many of these steps contain further "hidden steps" within them—to keep you getting stronger for a lifetime. The wise old Chinese man shouted to his rickshaw driver: "Slow down, young man, I’m in a hurry!" If ever a warning needed to be shouted to our nation of compulsive strength-addicts, this would be it. You see them everywhere: the halt, the lame, the jacked-up, the torn, the pain-ridden—the former glory-seekers who have been reduced to sad husks of their former selves by rushing helter-skelter into heavy lifting without having first built a firm foundation. Paul Wade reveals the ten key points of perfect pushup form. The aspects of proper form apply to all your pushups, and they’ll not only unlock the muscle and power-building potential of each rep you do, but they’ll also keep you as safe as you can be. Bodyweight training is all about improving strength and health, not building up a list of injuries or aches and pains. They are so fundamental, we call them the Ten Commandments of good pushup form. Rated 9/10 It's almost like on demand coaching in a box! 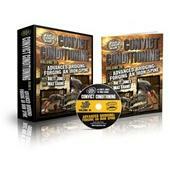 I am a huge fan of the Convict Conditioning books, so this DVD set was especially enticing. The training methods in the books have allowed me to achieve a level of strength that's unusual for most women. Having attended the first ever Bodyweight Workshop this past summer, I found that the skills from Convict Conditioning and Naked Warrior also allowed me to participate on a very high level. In other words, the methodical training and clear cut paths in the Convict Conditioning books has really worked for me. Sometimes though, it's hard to learn from words and pictures alone. I'm pretty sure I would have figured out several of the steps much easier if I had had a DVD to reference. I'm still chasing the 1 arm push up, but after seeing this, I have a much better idea of what really needs to be done, where to start, and what to fix. You should know that this is NOT a "workout DVD" it's much more like having a coach (Brett Jones and Max Shank demonstrate the exercises with John Du Cane narrating) in a box at your service 24/7. It's made like a reference resource. Whether you've purchased the original Convict Conditioning book or not, you will be able to see, hear and read (the included manual has the entire script of the video, accompanying charts, photos) all the cues and intricacies of each step. I balked at the price until I realized it was more of a training and study tool rather than your typical workout DVD. Since I am an RKC Level 2 Instructor and charge my clients accordingly, I also realized that the price of the DVD set is less than what I charge for a single one on one hour training session. Since the coaching and descriptions are highly detailed, you will want to watch this with the remote handy for pausing/rewinding while you try the movements. If you pay attention, it's very obvious to see exactly what you should be doing. Even though with Max and Brett's skills some of these very difficult movements look deceptively easy. If you really take your training seriously, this product will have a LOT of value for you - over and over again. In fact, I watched the section on push up theory again before leading my group class tonight and used some of the concepts to great effect. My only complaint is that in places (some of the hidden steps) some of the editing moves a little fast, so keep the remote handy. The fact that it's filmed in Alcatraz is a really neat plus. This is a real breath of fresh air for those of us who just want to do some serious training and are tired of mainstream saccharine workout videos. It's literally unlike any fitness video set I've ever seen, can't wait to see the other ones. 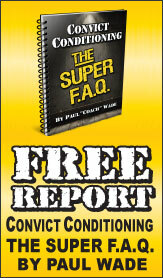 I am using this manual and DVD not just for my own training, but for the training of my athletes. It shocks and amazes me how varsity high school athletes can NOT perform a solid push up.... not even 1! Getting them to perform a perfect push up requires regressions, progressions, dialing in the little cues that teach them to generate tension and proper body alignment, ALL of which carry over to other exercises. This manual is an awesome resource for Coaches. It can & should be used to educate those you train as well as shared with your staff. For those who have a love for strength, you will respect all the details given for each and every push up progression and you will use them and apply them. As a Strength devotee for over 2 decades, I've been through the grinder with free weights and injuries, push ups are something I KNOW I'll be doing for the rest of my life which is why I RESPECT this course so much! The lay out of this manual and DVD are also BIG time impressive, the old school look and feel fires me up and makes me wanna attack these push ups! This is a really great product. I can go on and on about it but all the previous reviews written pretty much sum up everything i would write about this. The only problems, if there are any, is that the trainers are walking demi gods and make this look way to damn easy. Another would be the price, but with the content that this comes with, the case, detailed book, location of filming, its well worth it. I just purchased volume 2, and i cannot wait for it to show up. I only wish the rest of the volumes would come out faster, but the ability to become a demi god like Wade and the trainers in this dvd is well worth the wait. Rated 10/10 Great Resource for Bodyweight Strength Training! I initially became interested in the Convict Conditioning System when I read about the grip training portion from Convict Conditioning II on the DragonDoor Forum. As a bodyweight strength enthusiast with an emphasis on grip training, my curiosity got the best of me and I purchased Convict Conditioning II. 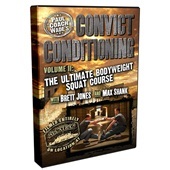 I was absolutely blown away by the quality of this book and decided to purchase the original Convict Conditioning book. Once again, I was not disappointed! The theory, exercises (and the reasons for their selection), progressions and the joint mobility segment were amazing. The aesthetic quality of the books were great as well! I could go on for a long time about these books but this review is about the Pushup Series DVD. This video is exceptional (the filming, lighting, sound quality, John's voice over, etc.). The manual that accompanies the DVD is beautiful! The idea to film the DVD at Alcatraz was brilliant! I had already studied and implemented the pushup exercises from the first book and had a very good understanding of the progressions and techniques but thought that it was very helpful to have a video to follow. It helps to be able to view the whole technique in addition to the sequence pictures and written descriptions that are available in a book. The exercises were expertly demonstrated by two exceptional athletes (Brett Jones and Max Shank). I highly recommend this DVD to anyone that is serious about mastering the pushup! Paul Wade has an absolute wealth of knowledge about bodyweight strength training and physical culture. I have become a huge fan! I get a lot of DVDs and books to review. A lot. In fact, it is a rare day at the office when Meagan doesn’t say: “Hey, here’s a package.” I am always hoping for wine or checks, but usually it is a new nicely packaged DVD with an attractive woman on the cover doing a curl with a kettlebell. I don’t review more than 10 percent of the materials I receive as I believe that kindness is part of my mission. Having said that, I often don’t get a single good idea out of the pantheon of wonderful superheroes, pin up models and guaranteed stardom programs that promise the world. So, I fully expected to be disappointed with Paul Wade’s Convict Conditioning, Volume I: The Prison Pushup Series. John Du Cane will tell you: I am not a fan of some of the stuff in these books. My family is on the “other side” of the law, except for some of the family members whom we don’t talk about. Making your own booze out of socks and a toilet is information I don’t necessarily need. It’s been said by others that this might be one of the most striking DVDs ever made. It’s on location in Alcatraz, close to my home, and the graphics are pretty amazing. And, as most people know, I don’t care about those things. Years ago, a noted internet boozehound and guru, took a potshot at the low quality of my DVDs. Yet, they are shared and passed around fighting units around the planet for their quality. So, yes, stunning. The DVD from Wade is stunning and very cool. The step by step progressions are clear, logical and can be utilized immediately. Let me just share one thing that leaped out to me as a game changing insight. Brett Jones and Max Shank, who do the modeling, with a fine voiceover by John “you missed your career in acting” Du Cane, do a small thing that might change your strength and symmetry issues over night. They keep their feet together and squeeze everything, like the RKC plank. I stopped the DVD at this point, walked over to the wall and did some wall pushups with my feet squeezed. Then, I attempted one-arm wall pushups and the asymmetry leaped out. I am now taking this basic lesson into my greater vision of teaching symmetry to my clients. I am probably jumping ahead, but try doing one arm rows on rings with the heels squeezed together, rather than wide like suspension for an SUV. The manual that supports the DVD is very helpful as much of the material is done too well in the DVD. Many of us need to take some time looking at the DVD then flipping the manual back and forth to “get it.” The use of the basketball, in fact, the whole “kiss the baby” insight alone is worth one’s time and money. So, let me be candid: once again, there are parts of this DVD and the series that rub me the wrong way. Having said that, I am frankly amazed at the insights of the product here. As a coach, I am better than when I popped the box open. I have a whole set of tools, and the progressions, that I can use tomorrow with my group. That to me is the testimony that people should hear from me: I watched it and I applied it instantly! The last thing this industry needs is more “You can do this and you can do this and you can do that and this and that” DVDs. This one “gets it.” You can apply what you learn instantly and know where you are going from there. Rated 10/10 Welcome to PUSHUP HEAVEN!!! Just got done watching this DVD and I must say I was blown away. In an era where we are constantly looking for new and fancy variations of exercises (and this DVD has plenty), there is a strong emphasis on posture, breath, and proper timing of movement. The DVD starts off with "The TEN PUSHUP COMMANDMENTS," a genius section on technique. It is very detailed but so easy to digest and understand. My advice to is not only watch the DVD but get down on the floor and do it. You will feel your pushup technique getting better right on the spot and that is why this DVD rocks; it MOTIVATES YOU!!! I have never been a big advocate of push ups and the reason why is because I have never been good at pushups. Sure, I can do some, but the level of detail that is taught in this DVD and Workbook has shown me how LOST I have truly been with this incredible PRIMAL and ESSENTIAL movement. The Pushup is one of the most basic and fundamental movements a human can perform and VERY FEW have achieved any respectable level of pushup mastery. The great news for you and me is that now we can ALL ACHIEVE push up mastery by following the TEN COMMANDMENTS and then the TEN STEPS (pushup progressions). The DVD finally ends with the VARIANTS. These are the advanced variations of pushups including the Dive Bomber Pushups, Superman Pushps, Tiger Bend Pushups, Clapping Push Ups and then finally the elbow lever. You could spend a lifetime perfecting these push up variations as well as practicing the TEN COMMANDMENTS of pushups. The Alcatraz setting is beyond cool and seems very appropriate. The entire flavor and vibe of the DVD just flat out rocks! The music, the lighting, the creativity of the filming is SUPERB!!! Unbelievably fun and dynamic information presented in a very clear yet motivating manner! You will be super pumped to improve your pushup power. I am very motivated to continue my pushup progressions and I know you will be to! Welcome to Pushup heaven!!! Rated 9/10 Stop reading reviews and order this DVD! This is a first class product with world-class instruction. The DVD is a good idea because seeing the exercises (in my opinion) is better than looking at stage-photos in a book. If you don't gain strength and power, it's on you - not because of this DVD. By Jon K / S. Milwaukee, U.S.A.
All in all it's an ok item but definitely not worth the price you pay for it. It's nice to see how they do the exercises so you know how to have correct form while performing them. For the price you pay for this item, it should be a complete workout video and not just Convict Conditioning the book but in video form. By Daniel Earl / Bloomfield, IN, U.S.A. Being a devoted 'Converted Convict' to Paul's work, I naturally wanted to get my calloused hands on the DVD (as well as the rest of 'em). I was a little uneasy with the high price, but I wasn't dissapointed. Ideally this is more for coaches & trainers rather than an individual just interested in fitness (they have to be obsessed). Thankfully that applies to me. HIghly reccomended, you won't be dissappointed. One can't go wrong with Old School Calisthenics.